Chic plus size cocktail dresses are available for those who want to look fantastic at that next party or special event. The key is knowing what to look for and where to find it quickly. These three popular looks in cocktail dresses help flatter fuller figures. Going back to their 50s roots, cocktail dresses from this era have made a comeback with their gorgeous taffetas and full swinging skirts. The full skirts happen to flatter shapely legs, so if retro is your thing, you are in luck. Chic Star specializes in providing full-figured ladies with an abundance of retro styles to dress up date nights and guest appearances at weddings and other gala events. If you have your heart set on a flowing, flirty full-skirted cocktail dress, you need look no further than their Black Satin Sleeveless dress. This classic 1950s design flatters all body types with its gently scooped neckline and belted waist. Going sleeveless allows you to artfully bare the length of the arms, which draws the eye upward in a vertical line to slim and balance the full skirt. A simple black dress leaves plenty of accessorizing room to add colorful accessories, cute shoes, or vibrant shawls and scarves to play up your best assets and downplay others. 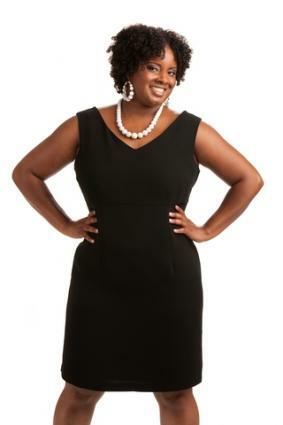 Black is a universally slimming and elegant color, so it can work for most plus size figures for a variety of events. Sydney's Closet offers a wide selection of unique, hard to find designs and fabrics in their collection of little black cocktail dresses like the one they call Razzle Dazzle Party Dress. The plunging V-neck and sleeveless style bares the arms and bosom for extra appeal and a slimming profile that looks elegant and classic. Choose a dress with built-in boning or cleverly placed embellishments, and you can pull off a strapless dress look with zero effort. Pair it with a sequined shrug if you want to add a little pizzazz for a fun evening out. Simply Dresses' elegant long evening gown is the perfect example of how this can work. The starburst pattern of glitzy embellishments accents the cinched high waist and adds chic drama to an otherwise simple design. The embellishments paired with the strapless dress design help make the waist appear smaller and give a beautiful silhouette. For ladies who want a little more support or coverage, choose a sleeveless style with a similar pattern. If you in the market for a curvaceous cocktail dress for that semi-formal affair, your best bet is to shop online or at a brick and mortar store specializing in plus size clothes. Buying your new dress at one of these venues makes it easy to find both the perfect dress and the necessary accessories such as plus size push up bras or strapless bras that provide support to a full figure and create the desired effect. You'll look like you just strutted off a fashion show catwalk when you show up at your next event in one of the stunning cocktail dresses from Kiyonna. From retro glam lacy dresses to whimsical wrap dresses to full-length elegant gowns, the toughest part of shopping here is deciding which of these gorgeous outfits is your favorite. Lane Bryant, well-known as a go-to source for full-figured women, carries a full line of gorgeous formal wear that is perfect whether you are shopping for something special for the holiday season or looking to dress-up for an intimate date night. At Lane Bryant, you will always find the latest designs without a gaudy flower print in sight. Flaunt your fashion sense and make an eye-catching entrance in one of these high-end brand name dresses from Macy's. Featured designers include fashion icons like Lauren by Ralph Lauren, Calvin Klein, or Xscape. Shop online or visit your local brick and mortar store. The Rose Dress has a nice selection of colors and embellished styles. Their dress offerings include both looks that are fun and youthful and those are a bit more sophisticated. Everything can be delivered straight to your home and there is an easy return policy if that ideal dress doesn't work out exactly right. V-necklines and wrap dresses are slimming yet fashionable. Play up your unique shape with fun mini polka dots, pastels, or layers of chiffon in strategic locations. Choose a traditional little black dress styled with princess seams and a sweetheart neckline. Opt for empire waists, which are especially flattering for the plus sized woman. You know when to wear a cocktail dress, how to dress it up or dress it down, and now you know where to find the dress that's right for you. Plus size cocktail dresses are more fashionable and popular than ever before, so go ahead and shop for your dream dress -- you are bound to find it.